I am always eager to try a new fragrance from Providence Perfume Company, because I know it will be interesting and stand apart from the crowd. Samarinda is no exception, and testing it has involved keeping my nose firmly glued to my wrist. It's one of those perfumes that has so many interesting notes that it's hard to focus on trying to analyze it; I keep getting pulled in by one thing or another and “following” it with my nose, only to be led astray by something else. 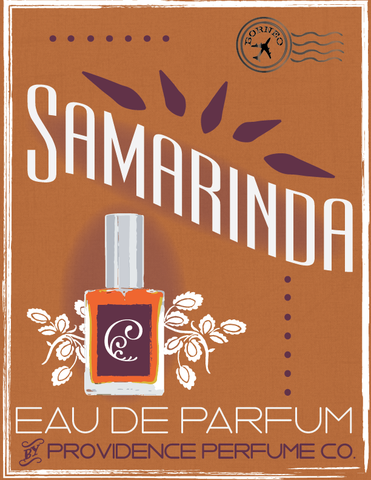 Samarinda is not a heavy-handed Orientalist fragrance loaded with spices and patchouli, as one might expect from something inspired by Indonesia, but rather a subtle perfume that mesmerizes by stealth, unfolding one beautiful note after another until its full glory is revealed. It captured me immediately with a particularly excellent cardamom opening – that is my favorite of all tropical spices and it's usually relegated to a supporting role in masculine scents and often overwhelmed by bolder notes, so it's a rare treat to find it in a fragrance I would actually wear. A delicious sweet orange is the perfect accompaniment. The floral heart that includes a rich orange blossom is sweet and redolent, but its headiness is tempered by a deep impression of Sumatran coffee, enough to give the whole thing a backbone, and not overdone; it is by no means a coffee perfume. Just when you think that is the final act, the base notes begin to peek out, and they are quite unusual – jasmine rice (another one of my favorite aromas), rum, vanilla oakwood, and of all things, roasted seashells. I have smelled the last in a couple of other natural fragrances and it's fascinating, a warm mineral note that's not really smoky, more earthy and salty. Combined with the savory aura of the jasmine rice, it creates a feeling like a sense of place. I can imagine a small island village where the smells of cooking mingle with the aromas of spices and jungle flowers, and over all there is dust and mud, perhaps the essence of the rice paddies where man and water buffalo work as one. A faint scent of the sea comes in on a languid breeze. Like all fragrances from this company, Samarinda is completely natural, and 5% of sales will be donated to the World Wildlife Fund to help preserve habitat and critically endangered wildlife in Borneo and Sumatra. I can't think of a more worthy cause, and this is definitely a worthy perfume. There is nothing discordant or “difficult” about it, just pure pleasure and a certain restfulness and ease as it spirits you away to your own private island dream. Perfumer Charna Ethier has once again shown us that natural perfumery is limited only by the imagination, and hers apparently knows no boundaries. Disclaimer: I received my sample of Samarinda for testing directly from Providence Perfume Company. Well, it seems to be good perfume for women but still one should try it first and then only decide. Also, the most important thing for a perfume is how long last that is the deciding factor for sure.